Two Popes Made Saints: How Does Canonization Work? On Sunday, nearly a million Catholics from around the world gathered at St. Peter's Square for the canonization of Popes John Paul II and John XXIII. Not only were two pontiffs being honored, but two more were present: Pope Francis presided over the ceremony while Pope Emeritus Benedict XVI looked on from a place of honor. "We declare and define Blessed John XXIII and John Paul II be saints, and we enroll them among the saints, decreeing that they are to be venerated as such by the whole church," Pope Francis declared to congregants during the two-hour mass. It was the first time two popes have ever been canonized on the same day. But wait. What, exactly, is canonization? If you're going to learn about canonization, you first need to know what a saint actually is. It's hard to pin down a precise definition, since different people may be recognized as saints for different reasons. In their essence, though, saints are people who lived lives of exceptional holiness. To be recognized as a saint, a person has to have been Catholic, and he or she has to be dead. It's important to note that the Catholic Church maintains that only God "makes" saints, and the church just recognizes what saints it can. For many years saints were designated by popular belief, and the first canonization didn't even happen until 993. Between the inherent unknowability of who is and isn't a saint and the murky history of the Catholic church, estimates for the number of saints vary between nearly 1,000 (from the first canonization) to over 10,000. What does a saint do? Catholics don't pray directly to saints. Instead, they ask for the saints' intercession with God on their behalf. "Since saints led holy lives and are close to God in heaven, we feel that their prayers are particularly effective. Often we ask particular saints to pray for us if we feel they have a particular interest in our problem," according to Catholic Online. Basically, it's like asking a friend to pray for you, if that friend's prayers are known to be extra-effective. I once had saints described to me as Heaven-dwellers who have God on speed dial. This brings us to canonization. The road to sainthood is a multi-step process: A pope can't just wake up one day and decide to make his recently deceased buddies saints. First, a potential saint needs to get him- or herself declared a Servant of God. That means a local bishop has investigated the candidate's life and writings for evidence of "heroic virtue" and presented the candidate to church authorities. Next comes veneration, which happens after a Vatican group called the Congregation for Cause of Saints further investigates the candidate's life. If the pope signs off on the candidate's heroic virtue, that person is now "venerable." Now the candidate can move onto beatification. To earn the honorific "blessed," the candidate must be recognized as having performed a posthumous miracle. (The miracle requirement is waived if the candidate died a martyr.) Blessed individuals aren't quite on par with saints, but they are acknowledged as having made it to Heaven and possessing the ability to intercede on behalf of people who pray with them. They can be celebrated on their feast days, but usually only by people in the region or the religious order with which they are associated. For instance, Mother Teresa is now the Blessed Mother Teresa of Kolkata. Step four is the moment we've all been waiting for, and the moment that happened for two former popes on Sunday: Canonization. Becoming a saint requires having at least two posthumous miracles attributed to one's name, and unlike beatified people, saints are assigned feast days that can be celebrated throughout the Catholic Church. 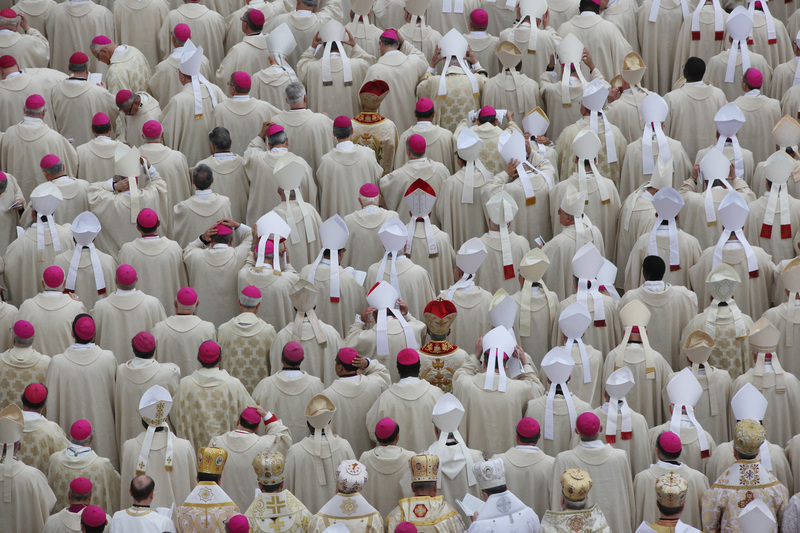 Only 80 popes have been canonized out of 266 in the church's history. So here's to you, Saints John Paul II and John XXIII!